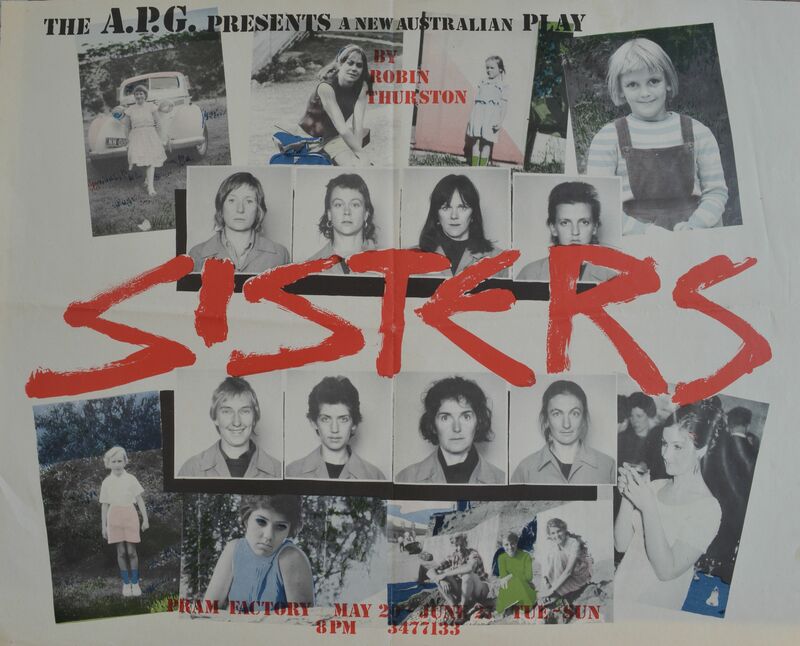 “Sisters” was staged by the Australian Performing Group in the front theatre of its Pram Factory theatre in Carlton from May 20 to June 23, 1976. Written by Robin Thurston, it was a prison show written by a man but with an all-female cast. They are pictured below in a copy of the poster. Actors (Top row , L to R): Claire Dobbin, Robin Laurie, Kerry Dwyer, Jane Clifton. (Bottom row, L to R) Ursula Harrison, Margot Nash, Roz de Winter, Jenny Jones. Director: Richard Murphet. Set: Carol Porter. Light: Laurel Frank. Op: Ponch Hawkes. Set Const: John Ley, Alan Robertson, Bayne Laurie. Voice & Movet: Wendy Robertson. Photo: Ponch Hawkes. This entry was posted in Alternative theatre, Australian Performing Group, Australian theatre, Pram Factory Theatre and tagged 1976, APG, Claire Dobbin, Jane Clifton, Jenny Jones, Kerry Dwyer, Margot Nash, Ponch Hawkes, Pram Factory, Richard Murphett, Robin Laurie, Roz de Winter, Ursula Harrison. Bookmark the permalink.